Then & Now - A look at a Yael K Design years later. Facebook was new (who would have thought you could use it for a business back then), Barack Obama became president, Western Australia decides definitely no way to daylight savings and a family moved into their new home. The front entry of the Cottesloe home today. Everything looking softened by its landscaping. This home became their place of refuge from the outside world for 10 beautiful years. They say a sign of good design is its ability to carry its function through the whole time while still keeping its stunning form. So what you would expect from a home 10 years down the track? A softening into its surrounding environment and still an ability to facilitate its inhabitants with everything they require. The crisp new front entry to the Cottesloe residence 10 years ago. New landscaping breaking up the new architecture. 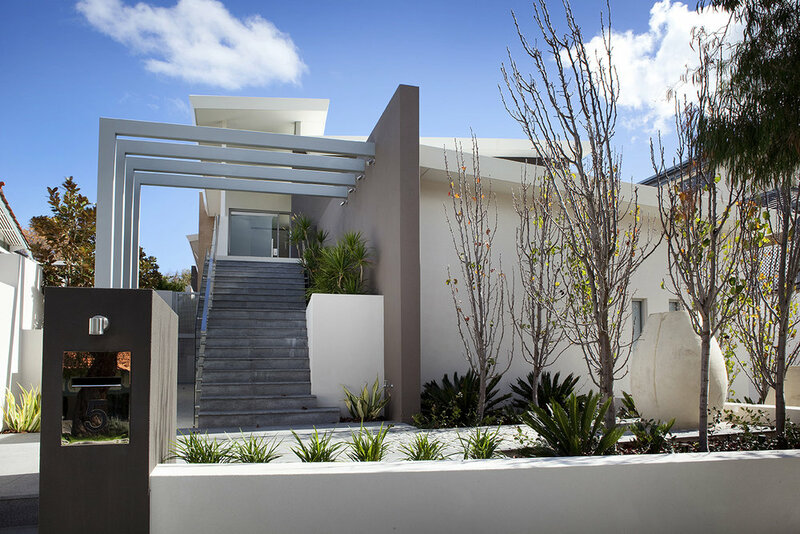 Another angle of the front of the Cottesloe Residence by Yael K Designs when it was first completed. Take note of the visible incline in the block at this early stage. Action Cottesloe image of the home as it is today. The front entry is a perfect example of a home softening into its surrounds. The growth of the garden balance out the retaining walls required on the sloped block and creating a natural privacy screen. Time moves on and people's lives change. The only thing with a luxury built home is that you can not pick it up and physically move it to a new location. So this home was recently sold to a new family. From this process we are given a rare opportunity to do a comparison on how well a Yael K & Associates designed home ages through the beautiful photos by the real estate agents at Action Cottesloe. Photo taken looking back at the entry door. Left image showing when the home was first finished. Right image taken by Action Cottesloe for the sale. Only change is a few finishing touches. An ageless kitchen. All white with high quality fixtures and fittings means it is made to last the test of time and has. Previous photographs taken by Ron Tan for Yael K Designs. Drones certainly were not so available to us 10 years ago and giving us some new improved angles. Such an amazing design and ageing so well. This project was a Yael K Exclusives project designed and nurtured right up to the point when the clients moved in. If you would like to experience something as beautiful as this home book an appointment with us today.